Optical Bandpass Filters are used to transmit selective wavelenghths of the spectrum while attenuating all other wavelengths. 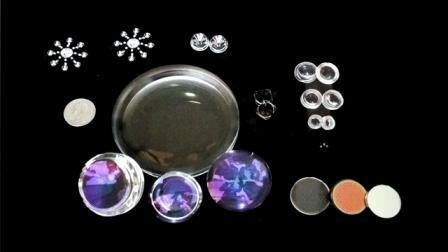 Syntec Optics produces complex optical coatings on plastics. Bandpass filters on glass are relatively straight forward to produce. However, when trying to produce this type of coating design on plastic substrates, complications arise. First, for most coating materials to be dense and durable heat/energy during the coating process is utilized. Obviously, with a plastic substrate the temperature during the coating run must be limited. Plastics do not have the same rigidity as glass, and optical thin films can have a significant amount of intrinsic stress. Therefore, certain thin film deposition techniques must be used to reduce and/or balance stresses within the film. One technique that can be used to benefit both the stress and density of films is ion assisted deposition.Plastics also have some attractive properties as well. A plastic substrate can be molded to include a multitude of mounting features instead of trying to mount a glass substrate utilizing additional fixtures. For certain applications the weight of glass is excessive. In these cases plastic substrates are an ideal substitute. Bandpass filters have a wide range of applications in both the commercial and military markets. Some of them include spectral clinical diagnostics, colourimetry, photometry, astronomy, fluorescence microscopy, spectroscopy, imaging, chemical analysis demanding spectral isolation. Get quality optical bandpass filters for a wide range of bandwidths at SyntecOptics.com. We design and manufacture complex bandpass filters involving thin film coating on plastic substrate.